thanks shadow ~~. sonic,shadow and amy. Wallpaper and background images in the Sonic the Hedgehog club tagged: sonic amy shadow. I feel sorry for Sonic. SHADOW SHURE DOES KNOW HOW TO ANOY SONIC!!!!!!!!!LOL! HA I JUST DID THAT TO MY FRIEND ! someone said shadow was "SOOOOOOOOO COOOOOOOOOOOOOOOOOOOOOOOL"
poor sonic... and shadow cracks me up XP nice one big brother! Shawdow must surely know how to annoy sonic! XD it's very funny !!! 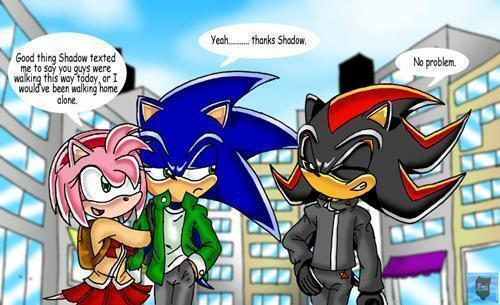 you know sonics face says:SHADOW IM GOING TO KILL YOU LITTERLY!!!!!!!! that's also in the "SonAmy" club. join it as I did! Sonic must really like Amy, but he wants to keep it inside himself. Then I would run up to Amy, smack her in the face, and tell her "Sonic has a girlfriend! Go team Sonic Sally!" oh and by the way I love ur pic! Shadamy stinks dude. Shadow is a loner. Oh I love Shadow. Nice work. I feel sorry for Sonic. Modern Amy is sooo annoying! so funny. I think sonic deserves it.